Frankly, there's no excuse for this. I like cooking. I love people enjoying my food. And now, through the wonder of the interwebnet, I can publish my recipes to, er, both of you. There are very few ocassions when I feel I can genuinely say "enjoy". This isn't one of them. There are no implied warranties blah blah. Your mileage may vary. Improvements? Always welcome. 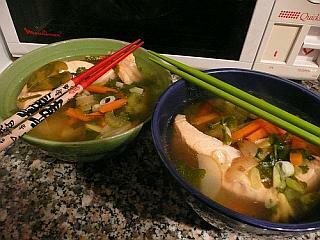 Make the broth with miso paste and hot water (if you do fish sauce, which I don't, you could add some). Add the ginger, lime leaves, sesame oil to flavour, chopped chillies if you are so inclined. Poach the salmon in the broth - takes 10 - 20 minutes, depending how well you like it. While it's cooking add all the other vegetables; if using brocolli and others that only need a little cooking, put them in 5 minutes before the end. 5 minutes before the end, put in the egg noodles. Serve, with freshly chopped coriander.